This soup was really delicious, although I would add more sausage next time, and maybe some white beans (suggestion of my housemate Jessie). An excellent post-Halloween party soup. Green beans roasted in sesame oil are on the side. Heat 2 T oil in a heavy large pot over medium-high heat. Add sausage and cooking until brown, about 8 minutes. Transfer to paper towels to drain. Add onions and garlic to the pot and cook until translucent, 5 minutes. Add the potatoes (and a bit more oil if needed) and cook until beginning to soften, about 12 minutes. Add broth, bring to a boil, and then simmer, covered, until potatoes are soft, 20 minutes. Using a potato masher, mash some of the potatoes in the pot until you get a consistency you like. (I also boiled the soup a few more minutes at this point to help it thicken up.) 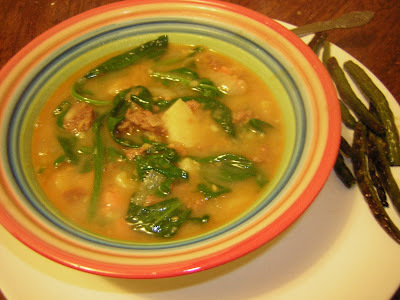 Add browned sausage back to the soup along with spinach. Simmer until spinach is just wilted, 3-5 minutes. Season with salt and pepper and serve. I thought this dish would be perfect for Sweetnicks's ARF/5-A-Day roundup since it has lots of yummy veggies in it...you can see the rest of the entries here, starting on Tuesday evening. 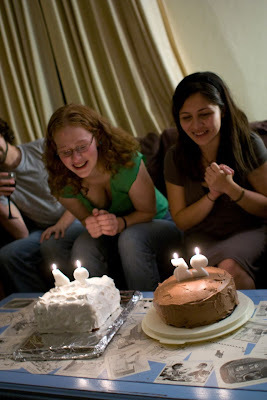 A couple of weekends ago, my housemate and I had a joint birthday party and we each baked a cake for the occasion. My housemate made chocolate with chocolate buttercream frosting and I made coconut with seven-minute frosting. Cakes are much more complicated than cupcakes, I realized, but it was still a lot of fun. The cake itself was one I'd made for my mom's birthday a couple of years ago, so I knew it would be tasty. I'd never made seven-minute frosting before, what with the double boiler (which we don't have, so I was desperately trying to hold two pans together), the candy thermometer (which we also don't have; I think I was using a meat thermometer? ), and then of course the seven minutes of beating the icing (not too terrible, but a little trickier with a hand mixer than with a stand mixer). But, it was worth it! The frosting turned out great, shiny and meringue-y, and tasted wonderful. 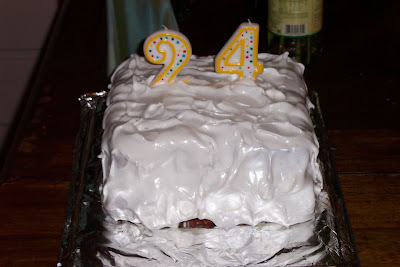 One piece of advice is to not make this frosting too early--by the next day, the frosting on the leftover cake had serious problems and had lost most of their air in it (though it was still delicious, it wouldn't look right for presenting the cake). 1. Preheat oven to 350 degrees. Butter two 9x9x2 square baking pans (I used 8-inch square pans and didn't have a problem). Dust with flour. 2. Sift together flour, baking powder, and salt. Pulse shredded coconut in a food processor until finely chopped and then mix into flour mixture. 3. With an electric mixer, beat together butter and sugar until light and fluffy, about 4 minutes. Beat in the whole eggs, egg whites, and vanilla until fully incorporated. On low speed, add the flour in two parts, alternating with coconut milk and beginning and ending with the flour. 4. Divide batter between pans and smooth. Bake until a tester comes out clean, about 55 minutes. Cool on a wire rack 30 minutes, then remove from pans and let the cakes cool completely. 5. Frost with seven-minute frosting between layers (1 1/2 c) and spread all over the rest of the cake. 1. Combine sugar, corn syrup, 1/4 c water, and egg whites in a double boiler set over simmering water. Cook over medium heat, stirring frequently, until the mixture registers 160 degrees on an instant-read thermometer, about 2 minutes (took mine longer). 2. Beat with an electric mixer on high speed until glossy and voluminous, about 5 minutes. Beat in the vanilla. Use immediately. Here we are with the cakes! Dinner tonight was extra delicious. 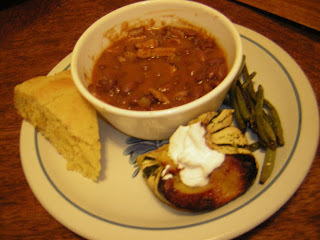 I had some leftover bean-and-bacon soup that I made yesterday night, and which mostly tastes like baked beans but even better, along with cornbread, roasted sweet dumpling squash, and roasted green beans. The beans are great--the taste of baked beans but without any baking, and very easy to do. The cornbread is also very easy and good--adapted from a corn muffin recipe of Dorie Greenspan's, but baked in a round pan. I recommend looking for the sweet dumpling squash if you can find it--acorn is also delicious, but the sweet dumpling is really special. We got a couple in our CSA box last week and have greatly enjoyed them. 1. In a medium saucepan, cook bacon over medium high heat until browned and crisped, about 7 minutes. Transfer to a place and pour off all but 2 T of the oil. 2. Add onion and garlic and cook until softened, 5 minutes. Add tomato paste and syrup or sugar/honey, and cook over moderate heat, stirring, until everything is incorporated and bubbling. Add the beans with their liquid and cook until thickened, about 5 minutes. 3. Add the chicken stock and bacon, season with salt, pepper, and cayenne, and simmer over moderate heat until thickened, about 15-20 minutes or more (depending on how thick you want it). 1. Preheat oven to 400 degrees. Butter an 8-inch round pan or a muffin tin. 2. Whisk together dry ingredients. In a glass measuring cup, combine wet ingredients and whisk together. Pour wet ingredients into dry and mix together with a rubber spatula, being careful not to overmix. Stir in the corn and marjoram. 3. Bake until a tester comes out clean and cool slightly before cutting into wedges. Preheat oven to 400 degrees. Cover a large cookie sheet with tin foil. Cut the squashes in half and use a pastry brush to brush oil over all the cut surfaces. Place face-down on the cookie sheet, two on each end with a gap in the middle. Put the squashes in the oven. While the squash starts to cook, prepare the beans by rinsing and then cutting off both ends of each bean. Toss in a large bowl with olive oil, salt, and pepper. Pull out the cookie sheet and dump the beans in the middle. Bake about 20-25 minutes longer until the squash is soft and the beans are nicely browned. You may want to check one or two times during cooking and toss the beans to make sure they don't burn. Optionally, toss the green beans with balsamic vinegar before serving. The squash is also excellent with a scoop of sour cream on top. Hi! I have decided that I cook and bake enough to want to warrant snapping a few shots and posting them here...we'll see how long the experiment lasts! This week, I've been particularly excited to start cooking from Dorie Greenspan's Baking from My Home to Yours, which is of course famous in the blogosphere but which I just got in the mail...yay! 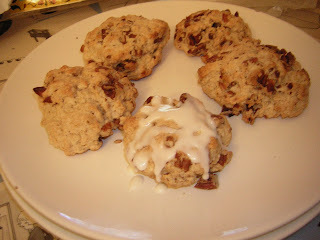 The first recipe I made was the Corniest Corn Muffins, which I'll post about later, but today I made her Pecan Sour Cream Biscuits...I iced them and called them scones, and my housemates never knew the difference. ;) Very delicious! I love making scones because they're super easy but feel very special, and these definitely did not disappoint. 1. Preheat oven to 425 degrees. Coarsely chop the pecans and then toast them over medium heat in a small saucepan. Set aside to cool. 2. Whisk together flour, baking powder, salt, and soda. Whisk in the brown sugar. Drop in the butter and cut in with a pastry cutter (or your fingers). 3. Stir together the sour cream and milk and pour in. Mix together with a fork and then knead briefly to bring the dough together. Knead in the pecans. Scoop up spoonfuls of the dough and pat into 12 rounds. Place on a cookie sheet lined with tinfoil. Bake about 12-15 minutes until nicely browned on the bottom. 4. Make a quick icing--mix together confectioner's sugar and half-and-half until you get a thick but drizzle-able consistency. Drizzle over the scones and eat them warm.